The Apostles’ Creed is a dynamic treasure. When we fail to use it, at least as a basic guide to essential teaching, there is a definite vacuum in our churches. We are generally left to choose the important truths that we want to major on. The result of this approach brings more disunity and doctrinal confusion, not less. In church history we can clearly see that no human document has ever served a greater purpose in uniting Christians around a common faith than the Apostles’ Creed. It was confessed in one’s holy baptism, affirmed regularly by the whole gathered church and openly expressed essential Christianity for Christians everywhere. The Apostles’ Creed has the pride of place in history as well as the clarity of true simplicity. There is plenty here to offend the sensibilities of almost all modern ideas and cultures, which makes it the perfect ancient-future faith way to establish fidelity and unity. In the early church this creed provided a rather explicit response to three challenges. The first challenge was to define the experience of Jesus within and over against the shared story of Israel. The second challenge was to clarify the complex understanding of God that was embedded in the resurrection experiences. The third challenge was to correct misunderstandings of the newly emergent “Christian narrative,” that was, at heart, a “story about Jesus.” (Luke Timothy Johnson, The Creed: What Christians Believe and Why It Matters. New York: Doubleday, 2003, 10-11). It can now be seen that the very core of the apostle Peter’s sermon at Pentecost is largely, with modest additions, reproduced in the Apostles’ Creed. The creed is rightly named, not because it was written by the apostles, but rather because it comprised a true and faithful outline of apostolic preaching, or kerygma. 8 All who are acceptable because of their faith simply say, “The message is as near as your mouth or your heart.” And this is the same message we preach about faith. 9 So you will be saved, if you honestly say, “Jesus is Lord,” and if you believe with all your heart that God raised him from death. 10 God will accept you and save you, if you truly believe this and tell it to others (CEV). The creed plays three major notes that I believe should be seen and appreciated. First, it underscores what I’ve shown the past few weeks–faith is primarily trust in the living and true God “I believe in God the Father almighty . . . I believe in Jesus Christ his only Son our Lord . . . I believe in the Holy Spirit.” The key word is in. The creed does not say, “I believe that” nor “I believe the creed.” It says I believe in. Second, the creed is primarily a (historically true) story. This becomes evident when you pay attention to the names used: Jesus, Mary, Pontius Pilate. It also refers to specific events in history: death, burial, resurrection and ascension. These require faith for sure but they are stated as actual events! The creed is not abstract theology, but good news. 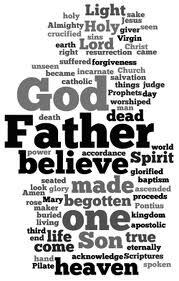 I believe every church should use the creed, not as rote recitation but as a faith affirming expression of catholic, apostolic faith. We should learn the creed, teach the creed and live the faith we confess in the creed. Here we can connect the head with the heart. Here we get both sides of the aforementioned same coin in the right place. With the faith rightly understood we can go into the world to love and serve our neighbors in the name and power of Jesus Christ.